High street department store John Lewis has announced a partnership with NICEIC to roll out a new ‘Home Solutions’ service to its customers. The scheme will be offered in a number of locations across the UK. 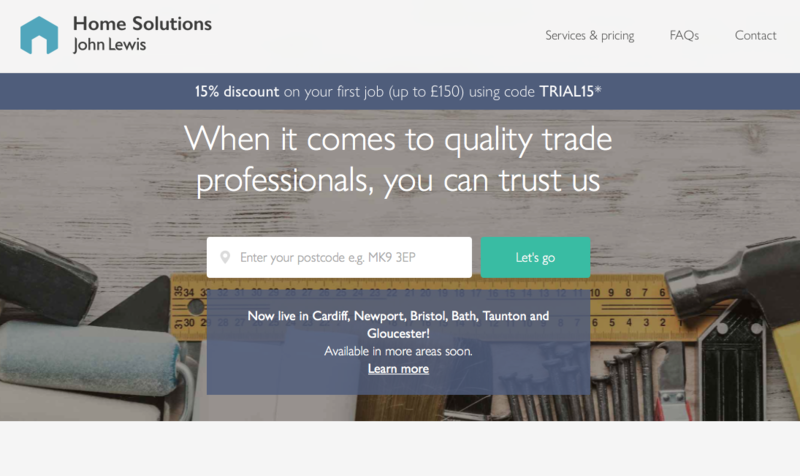 The service will provide customers with the ability to get in contact with professional tradespeople who have been thoroughly vetted, interviewed and assessed. Earlier this year, the service was trialled in Milton Keynes, and will now begin operating in six other locations – including Cardiff, Bristol, Newport, Bath, Taunton and Gloucester. John Lewis approached NICEIC last year to find electricians for the launch of the scheme. Several NICEIC registered contractors signed up to take part and a rigorous recruitment process was put in place, which included interviewing the tradespeople, background checks, and assessments of work they had done previously. John Lewis customers will be able to hire plumbers, electricians, decorators and other trades through the app, website and call centre-based service. The service aims to create more opportunities for registered contractors. The scheme is completely free for contractors to sign up to, and offers them the opportunity to grow their business as well as be associated with the well-known high street brand. “We are delighted to be working with John Lewis on the electrical side of this initiative,” says NICEIC CEO Emma Clancy. “Home Solutions brings together two trusted brands and will provide further opportunities for our contractors to win more work. “As a trusted retailer of home products, our customers often ask us if we can help them with tasks in their homes,” adds Tom Athron, group development director at the John Lewis Partnership.